DIAL: Silver sector dial with minutes graduation ring, blue tachymeter scale. Blued hands and chronograph hands. CONDITION REPORT: The watch is in overall good & original condition. The dial has some visible scratches and aging spots. The case is crisp and thick, appears unpolished. 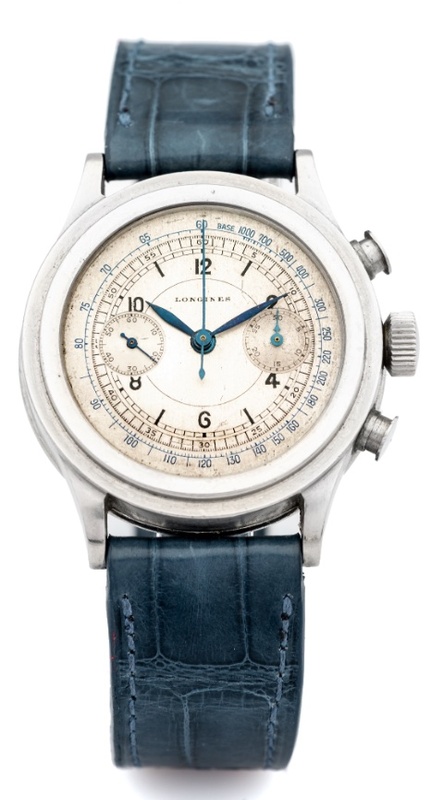 Overall a great example of this extremely rare chronograph from Longines. NOTES: According to the Archives Extract, the present watch was delivered to Ostersetzer, agent for Italy, in 1939. In exchanges with Longines, they have confirmed their internal reference for this watch is 4270 and the case order number is 2160. Longines was known throughout the middle of the 20th century for manufacturing some of the finest in-house chronograph movements in Switzerland. In the opinion of many collectors, the 13ZN is the best chronograph in Swiss history in terms of technology and quality. The Mushroom or Umbrella pusher case is an extremely rare batch of cases from approximately 1939 that are rarely seen on the market. These pushers were patented by Longines in 1938 with the stated goal on the patent of improving the water resistance of the pusher assembly and therefore the case.